Watching Durham Bulls Baseball: Should the Rays Be Worried? Not to spoil the double header sweep, but you bet they should. We write almost exclusively about the Durham Bulls, but we can’t completely ignore their parent club. 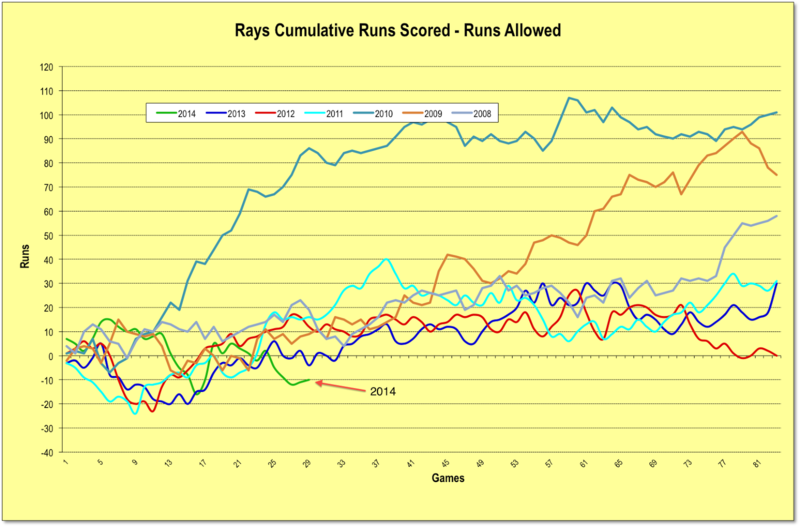 We also keep some simple stats, such as this one, which is just the cumulative runs scored minus runs allowed. As is obvious, they’ve had some bad starts in the past, but they have never been this far behind at this point in the season in the last seven years. By the way, their won-loss of 13-16 exactly matches their Pythagorean Expectation, also 13-16.